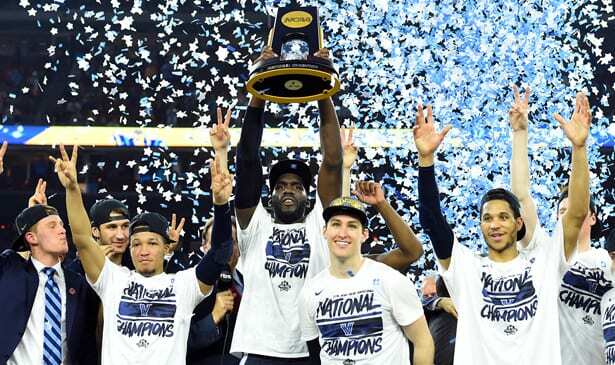 Villanova’s players hold high their second trophy in three years as Monday night they routed the Michigan Wolverines 79-62 in the NCAA men’s title game. Villanova became the first team to win all six games by double digit margins. On a night when their best (and arguably the nation’s finest) player was in foul trouble and had an awful game, Villanova still romped to an easy 79-62 victory over Michigan Monday to take their second NCAA title in three years. Jalen Brunson, voted by the Associated Press as Player of the Year and the team leader in scoring and assists, had maybe his worse game of the season. Brunson hit only four of 11 shots, scored nine points, and spent most of the second half on the bench after picking up an early fourth foul. But none of that mattered, thanks to sixth man Donte DiVincenzo. DiVincenzo had an epic night. He entered the game at the three minute mark of the first half and played 37 minutes overall. DiVincenzo set an NCAA record for most points off the bench with 31, which was also the most points scored by anyone since 1989. He made 10 of 15 shots from the floor, including five of seven from three-point territory. He also was six for 10 from the free throw line. Though he was the consensus Sixth Man of the Year this season in the Big East, no one expected that kind of performance in the title game. DiVicenzo’s heroics helped Villanova get through a rough early shooting period, where it seemed Michigan’s stout defense was once again going to be the difference. Michigan at one point had a seven point lead at 21-14. But DiVincenzo led Villanova on a 23-7 run that culminated with them being ahead at the half 37-28. He had 18 first half points. Villanova widened the lead throughout the second half, with DiVincenzo continuing to make amazing shots. In one 52 second span he hit consecutive threes. Villanova pushed the lead past 20, and with five minutes remaining were up by 20,. Both coaches conceded and cleared their benches. As expected, DiVincenzo was voted Most Outstanding Player. “Even if we played our best, it would have been very difficult to win that game with what DiVincenzo did,” Michigan head coach John Beilein said. “It was just an incredible performance. Sometimes those individual performances just beat you and you just take your hat off and say good game.” Villanova won its third overall title. Michigan was denied for the second time in five years, though they are now officially the 2013 NCAA champions as Louisville has been forced to vacate that title.